Who are Cameron King Estate Agents? 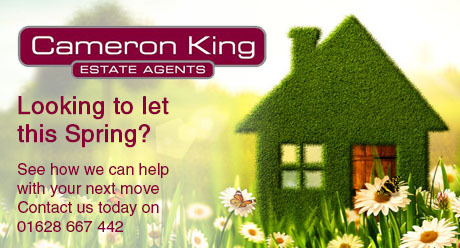 Cameron King, established in 2006, have a tradition of providing landlords with a comprehensive and efficient service. Our office, based in the heart of Cippenham, allows us to cover Burnham, Burnham Gate, Old Cippenham, Cedar Park, Windsor Meadows and Britwell, as well as the surrounding areas of Taplow, Slough and Langley. We pride ourselves on being able to offer the highest standards of service to landlords and tenants alike. We are an independent, family owned and run business with years of experience as Residential Estate and Letting Agents. We are proud to be regulated by The Property Ombudsmen ensuring that our service, ethics and morals are maintained to the highest standard. Our knowledgeable and enthusiastic team combine traditional estate agency experience with the very latest technology, going to extraordinary lengths to match your property to all possible prospective tenants. Therefore, you can be confident that the Cameron King team will work tirelessly to maximise all opportunities to let your home in the shortest possible time, at the highest achievable rent. If you require further information on any of the above fees, please contact a member of staff who will be happy to help. Cameron King Estate Agents are currently not a member of any Client Money Protection Scheme. Jonathan co-founded Cameron King Estate Agents in 2006 and has overseen the business growth since. Jonathan uses his vast property experience to proactively manage the smooth running of the company as well as working closely with the sales and lettings department to ensure a high standard of customer service is maintained. Lucy has recently joined Cameron King Estate Agents and is responsible for property viewings and appraisals, negotiations as well as liaising with landlords and tenants on a regular basis. Keith has been with Cameron King Estate Agents for just under two years and is responsible for the daily management of our let properties. This includes rent collection and reconciliation, maintenance issues and contracts as well as liaising with landlords and tenants on a regular basis. Very pleased to recommend you! More than happy with your service, and would be very pleased to recommend you! We would like to thank Cameron King for the regular quarterly inspections. This gave us the feeling of security that the landlord's responsibilities to us as a tenant would be met. Cameron King have always provided prompt responses to any queries we have had throughout our tenancy,allowing us to feel settled and safe in the property. This is the first time I've rented my property out and the help and guidance I received from Cameron King was incredibly helpful and reassuring. The property was only on the market for 48hours before Cameron King found an excellent tenant. I've been delighted by their service - so much so that I've also agreed for them to manage the property for me too. Cameron King are excellent and highly professional. I used Cameron King to let my property in Cippenham. I found them to be extremely knowledgeable in the letting market. It wasn't long until they found suitable tenants, who wereprofessionals, to meet the full asking price. Cameron King are very responsive when you need their assistance, contractors are on hand to solve any issues and a great team covering the admin side. All in all I would have no hesitation in recommending Cameron King to someone looking to rent and manage their property. I would like to take this opportunity to thank the team at Cameron king for all the help and support you have given me in the last year and would not hesitate to mention Cameron king to anyone looking for a property to rent or buy. We take this opportunity to thank the staff of the Slough office for the understanding and co-operation we have had from the agency during the period of our tenancy of the property. The content on this Microsite has been uploaded by Cameron King, Cippenham. Rightmove Group Limited makes no warranty as to the accuracy or completeness of the content, any queries should be sent directly to Cameron King, Cippenham. Where properties are displayed on a page, this comprises a property advertisement. Rightmove Group Limited who operate the website Rightmove.co.uk makes no warranty as to the accuracy or completeness of the advertisement or any linked or associated information, and Rightmove has no control over the content. These property advertisements do not constitute property particulars. The information is provided and maintained by Cameron King, Cippenham. Please contact the agent directly to obtain any information which may be available under the terms of The Energy Performance of Buildings (Certificates and Inspections) (England and Wales) Regulations 2007 or the Home Report if in relation to a residential property in Scotland and if you have any query over the content. Auction Fees: The purchase of this property may include associated fees not listed here, as it is to be sold via auction. To find out more about the fees associated with this property please call Cameron King, Cippenham on 01628 667442. No hard sell just good advice! Cameron King, established in 2006, have a tradition of providing vendors and Landlords with a comprehensive and efficient service. Our Office, based in the heart of Cippenham, allows us to cover Burnham, Burnham Gate, Old Cippenham, Cedar Park, Windsor Meadows and Britwell, as well as the surrounding areas of Taplow, Slough and Langley. We pride ourselves on being able to offer the highest standards of service to vendors and buyers alike. In addition, we also provide a comprehensive property management service to our landlords and portfolio owners. Our knowledgeable and enthusiastic team combine traditional estate agency experience with the very latest technology, going to extra ordinary lengths to match your property to all possible prospective buyers. Therefore, you can be confident that the Cameron King team will work tirelessly to maximise all opportunities to sell your home in the shortest possible time, at the highest achievable price. Experts at selling and letting property - No hard sell, just good advice. Thinking of buying? Register Now! Large stock of property - We have one of the largest selection of properties available in the Berkshire area! Be first to see New Instructions - If you are registered with us then you will receive our 'New Instruction' email alerts before the property hits the market. Weekly stock list - You will receive weekly email of properties that fit your price range. Accompanied viewings - No need to feel embarrassed or nervous meeting the owner, we will look to meet you and show you around. Be first to hear about a Price Reduction - We will email you as soon as a property is reduced. Regulated by The Property Ombudsman - Feel relaxed with complete peace of mind that you are protected by the code of practice we agree to abide by with TPO. Jonathan co-founded Cameron King Estate Agents in 2006 and has overseen the business growth since. Jonathan uses his vast property experience to proactively manage the smooth running of the company as well as working closely with the sales and lettings department to ensure a high standard of customer service is maintained. all into our office. David heads up the Sales Department at Cameron King Estate Agents. His estate agency experience equips him to deal with property acquisition, valuations and sales negotiating and incorporating a pro-active approach to all aspects of a property sale. Lucy has recently joined the business as Negotiator at Cameron King Estate Agents. Lucy brings with her a wealth of sales and customer service knowledge and skills to ensure she provides the highest service to both our sellers and buyers. Reviews - The important part of any business! At Cameron King Estate Agents we pride ourselves on providing outstanding customer service. We continually strive to set new service levels day in, day out and have established practice methods and procedures that many agents envy. We are experts in marketing and that is why we receive higher prices and faster sales. Along with the highest standards of customer service this makes us the No.1 choice to sell your home! See below some genuine reviews received recently! Staff always approachable, courteous and prompt. Eight days after Cameron King put my house on the market I'd received an offer. It was above the asking price.The staff in the office were always approachable, courteous and prompt. They contacted me several times during the sales process to inform me that information was required by a solicitor which enabled me to ensure the process was completed in the shortest possible time.I wouldn't hesitate to use Cameron King again myself or recommend them. Thank you for your help , support and advice in selling my mother's house.We would definitely recommend you, many thanks! I had a wide selection of Estate Agents visit my house for valuations and I'm so glad that I chose Cameron King. David is very friendly and efficient and has a good way with people. I was very happy with the level of communication I received about viewings, solicitors and final arrangements in my sale. The other staff in the office were just as helpful when David was unavailable. The house sold within six weeks and we completed within seven weeks after that. All in all a very smooth and swift process. I told David my ideal timescale for moving which other agents noted could be tricky. David delivered everything he said he would and two weeks earlier than my deadline too. This gave us extra time to settle into our new home before my son went back to school. I really appreciate all of your hard work, especially at the end, I know I was quite persistent (to put it a nice way!) I would definitely work with Cameron King again if I ever sell in the future. I would like to thank you for all the hard work you put into selling my house! God bless you all! Recently used Cameron King for the sale of my Cippenham flat, they were always on hand to answer any questions and went the extra mile in order to get some paperwork signed. Would recommend. Cameron King were the estate agents managing the sale of the house we bought - found them very professional and generally helpful. Thanks to David for the welcome card when we moved in. Highly recommended, made the sale of my flat as stress free as possible. David and his team were always on hand for whatever I needed, would not hesitate to use again. I can't thank you all enough 10 out of 10. The service provided by your company and staff is to be commended. The efficiency and professional way all matters were handled at such a difficult time for myself and my husband is appreciated. The difficulties that arose due to my father dying whilst the sale of his property was going through were handled promptly and quickly. I can't thank you all enough 10 out of 10. We found Cameron King great from day one. No pressure to sell or go with you which we liked. To have an offer we were happy with in a few days was great. We have suggested you to friends who are looking to sell soon. Thanks again to you, Lucy and Jonathan for all your help. If we ever come back your direction we will contact you.. I would have no problem recommending your services to anyone who ever asks and I can't thank you enough for making this as smooth as possible during a dark time for me.